For the Toronto Jazz Orchestra the impulse to create and adorn a large musical canvas may have been inspired by the first chamber, symphony and philharmonic; then with the great orchestras of Duke Ellington, Jimmie Lunceford, Charles Mingus, Lionel Hampton, Fletcher Henderson, Luis Russell, Gil Evans and so on, and here, north of the border, with Robert Farnon, Rob McConnell and The Boss Brass. But the reason it is an undying unit in the art of music is that there are still a few ensembles which have something significant to add to the Jazz musical canon. That the Toronto Jazz Orchestra is celebrating two decades of its existence is not simply reason to celebrate. Judging by the music on this disc, simply entitled 20 this is a new high watermark in the existence of the ensemble – one of the finest professional bands in Canada and a fine role model for the ones coming out of Toronto’s many aspirational University and College ensembles. 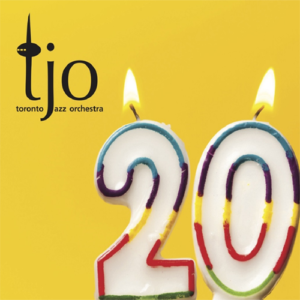 The Toronto Jazz Orchestra comprises some of Canada’s leading young Turks – low reeds master Shrirantha Beddage, trumpeters Alexander Brown and John Pittman, woodwinds players Jake Koffman and Paul Metcalfe, trombonist Christian Overton, pianist Carissa Neufeld and that ubiquitous genius, Luis Orbegoso. At the helm of affairs is the inimitable Josh Grossman, who actually deserves many more hyperbolic epithets to describe his musicianship, composer and management brilliance that have not only helped shaped the fulsome and swinging sound of this outfit, but that have kept it together, constantly evolving to the extent that it is now a powerhouse of talent and explosive chart-making. Clearly these musicians not only have enormous sight-reading ability, but as can be seen from – especially – the longer work “4PN” on this disc, the ability to make the black dots leap off the staved paper. In soli from various members and in its ensemble playing these musicians parley with the skill, energy and slickness of old friends. The glue that holds all of this together is, Josh Grossman, who burst on the Toronto music scene as a young trumpeter in the bands of Phil Nimmons, Paul Reed, Ron Collier and the Chris Hunt tentet. More recently, Mr Grossman bloomed into a formidable composer and arranger of music for small, medium – and as this music testifies – for large format ensembles as well. Mr Grossman has a clear and unified vision of this music’s trajectory, his interpretation grabbing you by the scruff of the neck and compelling you to follow its relentless path from the first bar to the last. Although this is a disc-wide occurrence it is especially vivid on “4PN” where much of the power and control of melodic storylines, eloquent harmony and viscerally exciting rhythms is on display. It is all a part of a carefully constructed musical process that notches up the tension by several degrees once we get to the development “Mvt III” and “Mvt IV” sections, which are projected here with brutal aggression, the music reaching its proverbial boiling point in “Mvt IV”, of course.